Canon has indicated there may be an issue with auto-focus in combination with lenses with a maximum aperture of f/8 on some Canon EOS-1D X Digital SLR Cameras with firmware Ver. 1.1.1. Firmware v1.1.1 enabled the centre AF point to autofocus when the camera is used with lens/extender combinations whose combined maximum aperture is f/8. On some of the cameras with firmware v1.1.1, auto-focusing does not function at f/8 aperture. Funnily enough this is only the case when the camera came with the v1.1.1 firmware out of the factory, not when the user (or Canon support) updated the firmware manually! 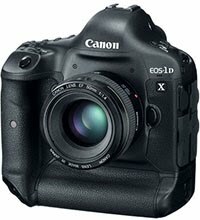 The problem affects Canon EOS-1D X DSLR Cameras with a 4 or 5 as sixth digit in the serial number (except when you have a white dot in the battery compartment).